Cardinal-designate Louis-Marie Ling Mangkhanekhoun, who will become the first cardinal from Laos, is an ethnic Khmu, a hill tribe from northern Laos and southern China. When St. John Paul II named Cardinal-designate Ling as apostolic vicar of Pakse, Laos, in 2000, the cardinal-designate told ucanews.com, "I never dreamed that this appointment was possible." On May 21, Pope Francis named his to the College of Cardinals; he will be elevated in a consistory at the Vatican on June 28. Father Raphael Tran Xuan Nhan of Vietnam's Vinh Diocese has worked in Laos since 2005. He described Cardinal-designate Ling as "a kind, friendly, wise and open-minded man. He is interested in evangelization work and welcomes all foreign missionaries to his country." 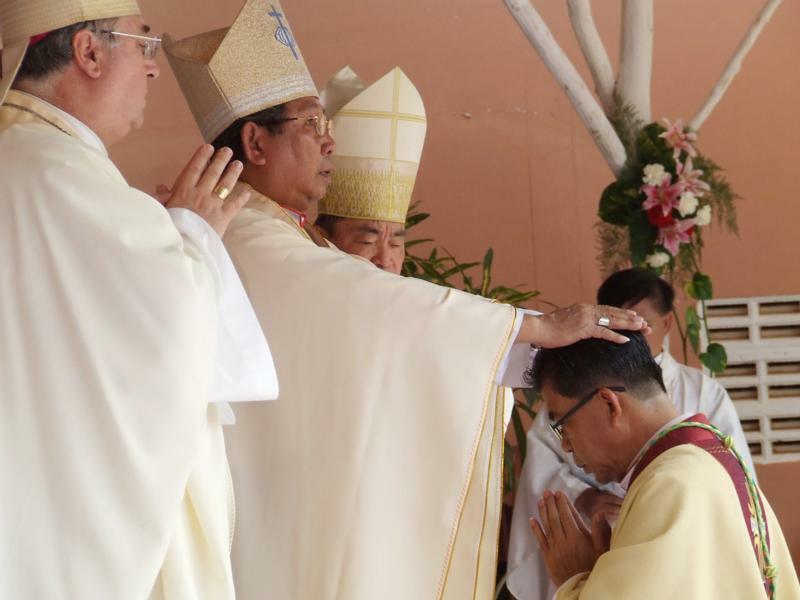 "Bishop Ling expertly uses dialogue rather than confrontation when addressing church issues and has helped government officials to understand that the Catholic Church is focused on social development," he told ucanews.com. Father Nhan explained that the cardinal-designate has worked hard to integrate Christian values into Laotian cultures and traditions so that the church can live in harmony with the Buddhist-majority nation. In a country with only about 45,000 Catholics, Cardinal-designate Ling has a method of seminarian education based on lay catechists, reported ucanews.com. He explained his system to the Rome-based AsiaNews in 2015: "The positive thing is that we have married catechists who are true missionaries, who go to live in the villages and become the 'roots' of evangelization. They go, live, they begin to build bonds ..."
"We now have eight major seminarians. They are very dedicated to the people, to the families. Through this sharing, we make our most important contribution, that is the faith," he said. Catholics in Laos told ucanews.com that Cardinal-designate Ling is diligent and kind to the local community. He has taken a keen interest in environmental issues, opposing the rapid deforestation by well-connected companies that pushed villagers from their land and created a spiral of social problems. Damming in Laos had threatened ecosystems, while rampant corruption was speeding the degradation. "Now we are starting to destroy ourselves," Bishop Ling told ucanews.com in a 2015 interview. "It's not from climate change itself but (it is) coming from human beings, and humans doing something very wrong to destroy the earth." Cardinal-designate Ling was born April 18, 1944, in northern Laos and was ordained a priest in 1972. An apostolic vicariate is a church jurisdiction established in mission regions where the hierarchy is not yet fully organized. Pakse is one of four vicariates in Laos, which has no dioceses.